Thornton Wilder’s “The Matchmaker” of 1954 marks a return to farce on the Festival Theatre stage after an absence of eight years. Christopher Newton is one of the few directors who respects farce as the dramatic genre that lives only on the stage not on the page, and as a result, as he has frequently shown in the past, he is one of the few directors who knows how to direct it without going overboard as is too often the case. “The Matchmaker”, however, is not a farce in the style of Ben Travers or Ray Cooney. It is, after all, by the same author as “Our Town” and deliberately exposes the theatrical illusion as does that play. The play begins with a character directly addressing the audience to set the time and place of the action and thereafter the action is periodically interrupted by such addresses as the various characters stand front and centre to explain their motivations or views on life. The farce also has a politic undercurrent in that Dolly Levi’s philosophy is that money should be spread around evenly for everyone whereas the man she connives to marry, Vandergelder, is a tight-fisted miser, a tyrant to his daughter and employees. “The Matchmaker” thus has resonances most farces do not have and Newton uncharacteristically errs in having the majority of the actors adopt too broad a style. The plot derives from Johan Nestroy’s 1842 comedy “Einen Jux will er sich machen” which Wilder has transplanted from Vienna to New York in the 1880s. (In 1981 Tom Stoppard adapted the same play as “On the Razzle”.) Horace Vandergelder, a rich merchant, has arranged for his daughter, Ermengarde, to marry into wealth despite the fact that she loves a poor artist. Dolly Levi, the matchmaker, has her own plans of marrying into wealth by marrying Vandergelder and secretly aiding Ermengarde to marry the one she loves. Meanwhile, two of Vandergelder’s workers, Cornelius and Barnaby, fed up with his strict ways and seeing only a joyless life ahead, decide to close the shop in his absence and go to New York to have the “adventures” they’ve always dreamt of. After a series of disguises and near encounters between Vandergelder and his errant employees, everyone turns up at the home of Ermengarde’s aunt where all the confusion is sorted out ending in four couples plighting their troth. In addition, Dolly’s success in marrying Vandergelder means a better life for everyone. The play ends with each character summing up for the audience in a word--each one different—what the meaning of the play is. The generally warm mood of the piece, its recognition of human foibles and the reconciliation at the end outweigh the various element of farce and suggest that a subtler approach to acting would be more appropriate. As Horace Vandergelder, Michael Ball turns in one of the gruff old man characters at which he is so expert. The only problem is that this older man is so unlikable that it is difficult to understand the off-stage reconciliation with Ermengarde at the end. As Ermengarde, Fiona Byrne is given little to do but hop about and squeal. Craig Erickson, as her beloved artist boyfriend, makes a few heroic poses but mostly is seen struggling with Ermengarde’s luggage rather too often to remain funny. Kevin Bundy as Cornelius could make more of his role if he had been encouraged to. We really should feel that he thinks this may be his last stab at excitement in life. Dylan Trowbridge as Barnaby takes a holiday from the psychologically complex characters he’s played recently, but Newton could have allowed his character to be a bit more than a ninny. The same could be said for Lisa Norton as a worker in the hat shop where the two boys take refuge. Patricia Hamilton as Ermengarde’s Aunt Flora is quite funny but could have toned down her performance a notch or two. The two main exceptions to the general trend of overemphasis are Goldie Semple as the matchmaker, Dolly Levi, and Corinne Koslo as Irene Molloy, the milliner who also longs for excitement. Wilder makes Dolly the real centre of the play. She knows what is wrong with the world she is in, having had more real experience in that anyone in the cast, and will do everything she can to make things right. The scene in which she manages to get Horace to propose to her in spite of himself is a true delight. What Koslo does with Irene is exactly what I wish Ball had done with Vandergelder and Bundy with Cornelius—she infuses her character with a palpable determination and passion, with the result that we care more what happens to her. George Dawson as Vandergelder’s new valet attempting to overcome his checkered past makes the most of his part. His address to the audience in the restaurant scene in Act 3 brings down the house. William Schmuck’s set is the perfect embodiment of the conscious artifice built into the play. Some props are three-dimensional, some only painted onto the two rotating walls of the set. The transformation of Vandergelder’s store in Act 1 to the milliner’s shop in Act 2 is a coup de théâtre as skyscrapers rise from privet hedges, the two walls revolve and a train chugging toward us suddenly rotates to become a wardrobe in the shop that has just formed. He has supplied everyone, especially Ms. Semple, with exceedingly attractive costume. All is enhanced by Kevin Lamotte’s sensitive lighting, especially in signalling when characters as inside the action of the play and when they step outside it. While Newton must have wanted to distinguish the style of this comedy from the “Easy Virtue” he directed earlier in the season, “The Matchmaker” could have been even more winning than it already is if he had encouraged more detailed performances from the whole cast. Newton has made the show a “romp” when it could easily have been more than that. As it is, the show is a pleasant diversion that one wishes had a bit more substance. 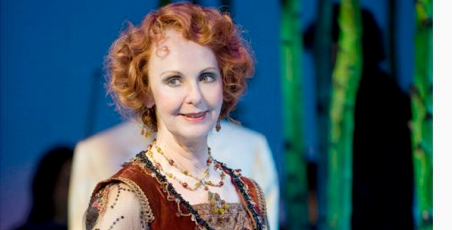 Photo: Goldie Semple in A Little Night Music. ©2008 Shaw Festival.